Greensburg, PA—At its September 2014 annual business meeting, the Accrediting Commission of Career Schools and Colleges (ACCSC) will recognize Triangle Tech located in Greensburg, Pennsylvania as a 2014 ACCSC School of Excellence. 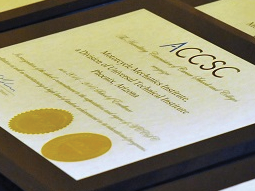 The ACCSC School of Excellence Award recognizes accredited member schools that, during their most recent five year period of accreditation have demonstrated a commitment to the expectations and rigors of ACCSC accreditation, as well as a commitment to delivering quality educational programs to the students, graduates and employers that deserve our best work. Through this award, it is ACCSC's intent to recognize the importance of this significant achievement, including completing the accreditation process without stipulation and having been timely in the submission of the fees and reports required of an ACCSC accredited institution. In addition, the School of Excellence Award recognizes the school’s efforts in demonstrating a high level of achievement among their students by a majority of the school’s graduation and employment rates from all programs offered meet or exceed the average rates of graduation and employment among the more than 800 ACCSC accredited institutions nationwide. In 2004 the School of Distinction Award from the Accrediting Commission of Career Schools and Colleges was awarded to Triangle Tech, Pittsburgh, PA; Triangle Tech, Erie, PA; Triangle Tech, Greensburg, PA; and Triangle Tech, DuBois, PA. Triangle Tech, Sunbury, was recognized and awarded the School of Distinction in June 2005. In October 2009, Triangle Tech, Pittsburgh, PA; Triangle Tech, Greensburg, PA; and Triangle Tech, DuBois, PA, were awarded the School of Excellence. In 2010, Triangle Tech, Sunbury was recognized and awarded the School of Excellence. The Triangle Tech Group is headquartered in Pittsburgh and operates schools in Pittsburgh, Erie, Greensburg, DuBois, Sunbury, and Bethlehem, Pennsylvania.